Panic Button is responsible for some of the biggest ports for the Nintendo Switch including Rocket League, DOOM, and Wolfenstein 2: The New Colossus. The studio is tackling another big port for the Switch with the popular MMO Warframe. But if the studio had the chance, Panic Button would love to port another massive game to the Switch. To bad it will probably never happen. 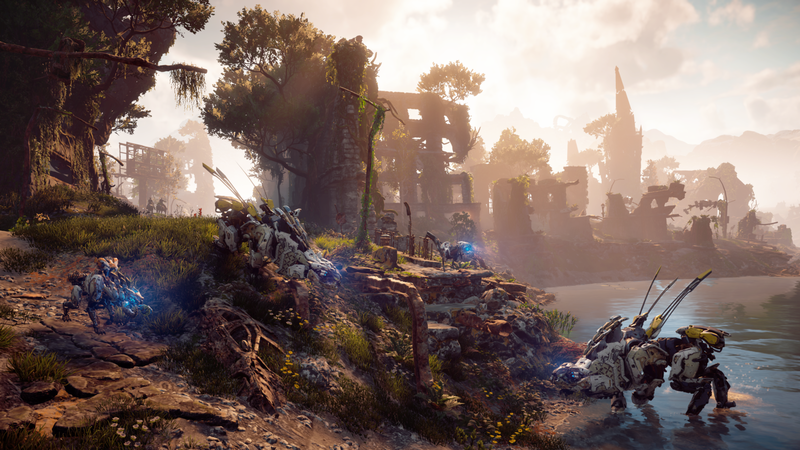 In an interview with comicbook.com the studio behind the big-name Switch ports would love to tackle Guerrilla Games' Horizon Zero Dawn. It's a beautiful-looking, massively open world game that would surely be a challenge to squeeze onto the Nintendo Switch. Of course, that's aside from the fact that since Horizon is a PlayStation 4 exclusive it will probably never leave the PlayStation system. Still, Panic Button appears to be talking mostly about the challenge of porting a game as big as Horizon Zero Dawn to the Switch rather than hint at any future plans. When we spoke to Panic Button at E3 2018 the team revealed that it is branching off to make its own original IPs. If anyone can tackle Horizon Zero Dawn and put it on the Switch though there's a good chance it's Panic Button. Their current project, Warframe, is also a massive undertaking and we'll see in the future how it pans out. Check out our Horizon Zero Dawn guide if you're checking out Guerrilla's open-world game on its native PS4 console. Tagged with Guerrilla Games,	News,	Nintendo Switch,	Panic Button,	PlayStation 4.